In late 1980, the bodies of four American women were exhumed from a crude grave in El Salvador. The women - Ita Ford and Maura Clarke, nuns of the Maryknoll Congregation in New York; Dorothy Kazel, a nun in the Ursuline Sisters of Cleveland; and Jean Donovan, a lay missionary from the Cleveland Mission - had been abducted, raped, and murdered. An investigation led to the trial and conviction of five Salvadoran National Guardsmen. But who was behind the murders? It was clear to Bill Ford, brother of Ita, that the Guardsmen were only triggermen. Ford, with help from the Lawyers Committee for Human Rights, set out to discover who had ordered, paid for, directed, and covered up the murders. In late 2000, the two generals finally faced the families of the victims in a West Palm Beach courtroom. Without direct evidence implicating them, the generals were charged not with killing or ordering the killings of the women, but with responsibility for the crimes under the command responsibility doctrine, which holds that as commanders they knew or should have known about the abuses committed by their troops, and can be held accountable for those crimes. The generals were found not liable for the crimes, but the case is under appeal and a decision is expected early in 2002. More importantly the landmark pursuit of the generals in federal civil court opens the door for more such trials. Building on the pioneering work of Bill Ford, another historic case is preparing for trial. 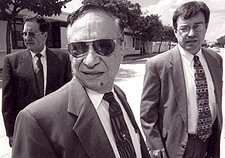 Known as the Romagoza case, it is brought by four Salvadorans who are seeking damages for the tortures inflicted on them by Salvadoran security forces during the years 1979 to 1983, while General Guillermo García was minister of defense and General Vides Casanova ran the National Guard. The Romagoza case is expected to go to trial in 2002. JUSTICE AND THE GENERALS offers unique insight into a new chapter in international human rights law, an important step forward in the campaign to bring military commanders to justice for crimes committed within their ranks. At the same time, as it follows efforts to hold human rights abusers accountable, JUSTICE AND THE GENERALS also maps the confusion, barbarism, and, ultimately, the tragic heart of a conflict whose wounds, two decades later, are far from healed. "It is incredibly encouraging to see a film that accurately depicts so many of the issues involved in securing justice and accountability, whether at a state, regional or international level."—Dr. Kelly Dawn Askin, Director of the International Criminal Justice Institute, Washington, D.C.
A long overdue investigation into the 1981 El Mozote massacre in El Salvador, and the Reagan administration's cover-up of it. At the International Criminal Court, Luis Moreno-Ocampo investigates and prosecutes accused war criminals, worldwide.